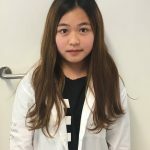 Today’s student interview was with Wendy who is 18 years old and comes from China. Wendy has been studying at Select English since January. Hi Wendy! Tell us something about your home town and your family. I come from Beijing, the capital of China. The centre is my favourite. It’s where all of the businesses and international brands are. I’m an only child. I was born around the time when the Chinese government had restricted families to having only one child so I don’t have any siblings. I have 2 uncles and 2 aunts and some cousins but they are much younger than me. I was studying in Singapore. I studied Combined Sciences, Maths, Accounting and of course English. I had a gap before going to university and wanted to improve my English and take my IELTS exam before I start. I already have an offer from a university in Australia but I am still applying to others. It’s really nice and my English has improved. I love my teachers Andy and Nadine. I like the buildings and living in a small town. I would like to exercise more. I have joined some school activities like Punting with Andy which was fun. Yes, I have been to London a few times. I visited York last weekend with friends which was so beautiful. We visited the Minster and the tower. It’s good to learn English. I really like the school activities. If you’d like to join an English course like Wendy, you can enrol here.